~Tails from the Foster Kittens~: When should I ask the internet for advice on my pet? When should I ask the internet for advice on my pet? 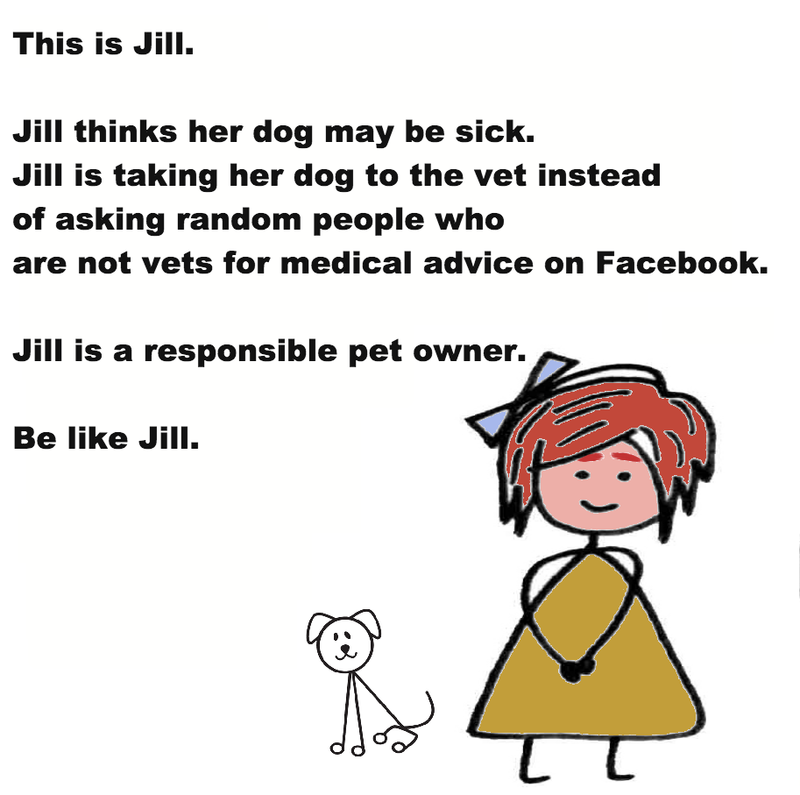 I was on Facebook the other day when I saw a post by the page Be Like Jill. 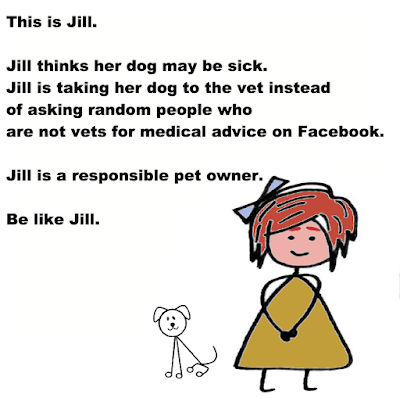 Be Like Jill posts memes of a stick figure girl and then types a few lines of what Jill does or doesn't do which is in contrast to what other people do that is annoying, like blindly posting 'warnings' on the internet without checking facts or not showing up to a date on time. This time, the meme was about getting advice on the internet. and I saw it because the American Veterinary Medical Association (AVMA) shared it on their page. The hatred spewed forth in the comment section of these two instances of this meme being shared prompted me to want to create a blog post on this subject. Having worked at a vet's office for a couple of years as a receptionist, I can tell you that there are a lot of people who make some of what this alludes to accurate and you want them to not ask strangers and wait to contact a vet, and especially not wait until Saturday morning at 11 am (when the vet closes at noon until Monday) to call in and say your dog hasn't eaten for a week and is vomiting all over the place. Having spent a lot of time on the internet in pet based forums you see a lot of people asking for advice, and seeing a lot of bad advice being given, I want to agree with this sentiment. But having received a great deal of wonderful and helpful advice on the internet I bristle at the idea of blanket statements like 'don't ask the internet', or 'all advice off the internet is junk'. When is it appropriate to ask for advice on the internet? when you seriously do not have a clue if what you are seeing is normal or not. when you have an issue with your pet and you are seriously out of your depths and want to talk to other pet owners who have gone through what you are going through. when you want confirmation that what you are doing is what other people have done and they have had good outcomes. when you are looking for resources to help you better understand what you are dealing with. when you have an issue and you legitimately* have no money to get the pet some help and you are looking for resources. When is it not appropriate to take advice from people on the internet? if your pet is in immediate distress. if you are unwilling to do some reading and looking for information on who wrote the article. I think we have all been there, wondering what is going on with our furry friend and wondering if what we are seeing is normal. You don't want to call up the vet and feel like a fool (but don't worry, they have heard way way more embarrassing things than you can possibly imagine, they won't ever make you feel like a fool - and if they do you need a new vet). Asking the internet can be a very quick way of finding out if you have a situation that requires some medical intervention or not, especially if it is after hours and the vet's office is closed. I also have come to learn a great deal more on how to care for my pet via the internet vs my vet. Talking with people who have dealt with the same issues I am dealing with can help me understand the situation I am in far better than a 10-minute visit with a vet (heck my last visit with the vet lasted barely five minutes). I never want to discount the need for a good client/vet relationship. There are things a vet can do that "people on the internet" can not. They can tell the difference between a cancerous mass and a lipoma. They can put their hands on the pet and feel if the bladder is full or empty. They can run blood work and determine if a thyroid level is normal or elevated. They can take an x-ray to determine if a bone is broken or not, and if it needs to be set or surgically repaired. But there are times when the vet simply is not well versed enough in a situation and learning more can help. I have seen cats with bladder being given convenia - which is off label - several times in a row despite it having a half-life of several weeks, heck I've seen vets give antibiotics when no infection is present. I've seen vets give very high doses of insulin to a newly diagnosed diabetic cat and not recommend home testing, heck I've even heard of vets recommend against home testing of diabetic cats. From the very beginning of the interwebs, there has been some really horrible information out there. 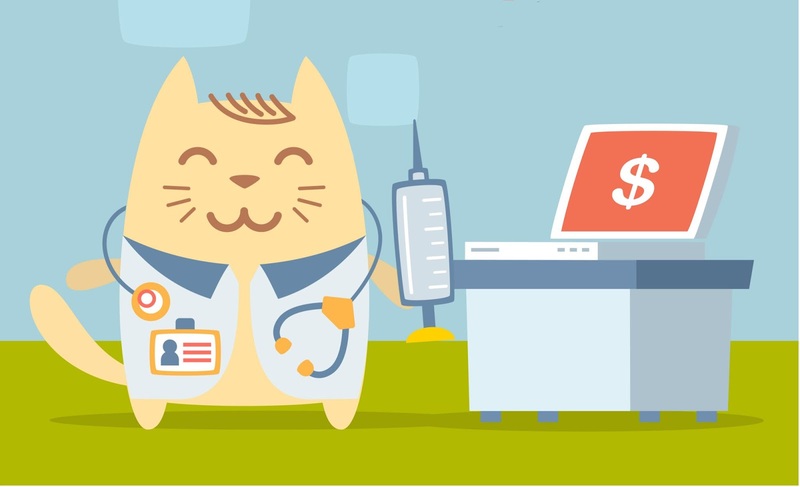 Vets and doctors have begun rolling their eyes at clients every time they start out saying 'but I heard on the internet' and completely dismissing what comes next. I think those vets are too complacent in their jobs and they feel they know everything. Those are the veterinarians you want to avoid. If a doctor is unwilling to help you understand why something you heard on the internet is not a good idea and even worse are unwilling to understand why something you heard on the internet might be a good idea, then that should tell you everything you need to know about them. If you can't question your veterinarian's decisions, and feel comfortable doing so, then you need a new one. You are not being a responsible guardian of your pet if you simply take the word of any one person about what you should do, even if that person is well trained or says they have a lot of experience. *if you legitimately do not have any money to take care of your pet, there are resources out there. Call your local animal shelter or rescue to see if they can help point you in the right direction of local options. Letting an animal suffer from a medical condition is animal abuse and is against the law. If you can not find the money, please take your pet to your local shelter or rescue and surrender it so they can get the help needed. Excellent post. I like to research on the web, but always go to the vet. More than once, I've been in the position of having differing opinions from two different vets about a particular situation, so it's not just the internet who gives conflicting advice. :) Of course, in an emergency, the cat goes straight to the vet, but in a non-emergency? I google away. Just to get some background info. This is good advice and ITA with everything. I primarily use the internet for resources after I've gone to the vet. It is a scary thing to google a symptom (like it is for yourself) that can mean anything from an infection from a brain tumor! I give you a huge Amen! I had a diabetic cat for 17 years (diabetic from birth...and I mean severely diabetic. Untreated he would be in the 500's). Be became insulin resistant and was getting neuropathy in his back legs. The vet said that his potassium was low and started giving him potassium. Too much potassium can kill you (just a fyi). I never had a vet tell me that I could take blood tests. I thought the vet always had to draw blood from their leg to test. I did research on the web (oh, when I first got him as a kitten, there wasn't a web - ha). When I spoke to my vet about what I found on the internet he said that you cannot believe everything you read. So, I called around and found and amazing emergency place. I took him there (I had to get a referral, which some random vet on the phone was willing to do for me). They taught me how to prick his ears (and where the veins were in the ears) to get a glucose reading. (By the way, swipe the ear area with a tiny bit of Vaseline so that the blood will bead and not get soaked up in the fur.) So, I got him on a special insulin, his glucose back in check and his legs working again. I gave my vet (who 10 minutes later was not longer my vet) an earful. He actually had the nerve to say that he didn't think I would be willing to pay for the treatment. (Obviously, he didn't know me at all.) I told him that his job was to inform me of every option, even if it was voo-doo and it was up to ME to chose what I wanted to do. Grrrr... I am now truly qualified to help anyone out with diabetes in cats, teach you how to give shots, take glucose tests, and what to do when you travel. So, trust your gut, gain as much info as you can and discern facts from fiction.